Seacoast United hosted a shoe/ball drive on Monday, August 27th as part of the Club’s U11-U14 Orientation at the Indoor Arena in Hampton. Families within the Club donated used soccer cleats, soccer balls, as well as new shin guards to benefit organizations in need, both domestically and abroad through SUSC’s Kick Back Program. Bags of balls and pre-loved gear filled over 8 large boxes throughout the evening as the Club welcomed both new and returning players for team meetings prior to the start of their fall seasons. Pictured are just a portion of the items collected on the evening. Thank you to all the families for your generous contributions! 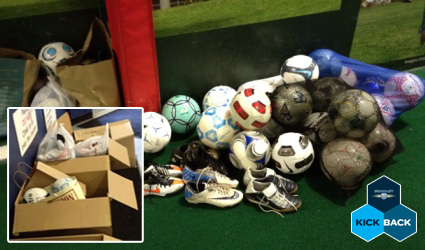 If you would like to donate your used soccer cleats and balls, donations are still being accepted at the Seacoast United Indoor Arena in Hampton, NH throughout the fall season. For more information on Seacoast United’s Kick Back Program, please click here or contact Matthew Glode at mglode@seacoastunited.com.